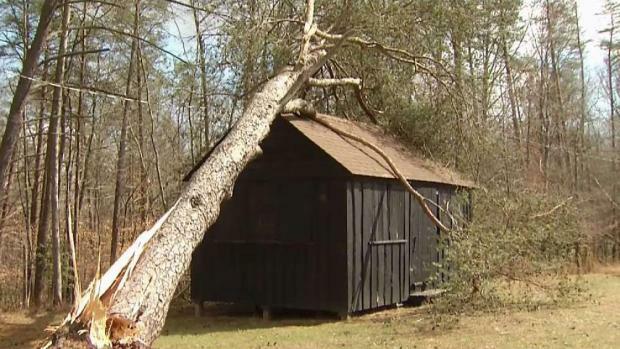 Parts of Prince William Forrest Park in Virginia will re-open Monday after a March windstorm closed the park to visitors for weeks. A National Park Service news release says areas that are clear of fallen and hazardous trees will open Monday. Visitors can enter the park from Park Entrance Road off of Joplin Road beginning at 9 am. Piedmont Forest Trail, Laurel Trail Loop, Birch Bluff Trail, and Crossings Trail will be open to the public. The Pine Grove Picnic Area and Telegraph Picnic Area will also open Monday. High winds that blew through Prince William Forest Park last week knocked down a number of trees. Now the damage, worse than the destruction after Hurricane Sandy, is forcing the Park Service to close it down for weeks. News4's Derrick Ward reports. However, most roads, trails, campgrounds, and facilities remain closed due to safety concerns following the windstorm. Prince William Forest Park administrators plan to open additional areas of the park as storm damage is mitigated. The storm, which brought wind gusts as strong as 70 mph to the region, caused more damage to the park than Hurricane Isabel, Hurricane Sandy and the 2012 derecho, the park service said. Prince William Forest Park is the largest protected natural area in northern Virginia.